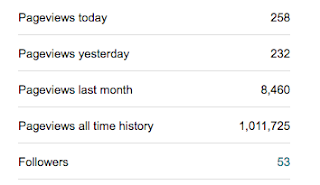 While I started blogging during my PhD (actually the first real post was from February 21st 2006), for some reason I only started recording statistics about the blog in May 2010. 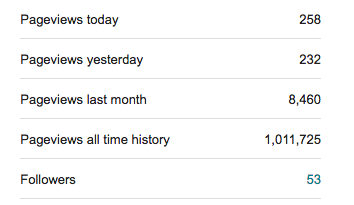 This month marks the milestone of over 1,000,000 page views. So I thought I would write a post that reflects this milestone. Initially, I started blogging as a way to keep track of agent-based models (ABM), example applications and toolkits I found interesting and this trend has continued over the years (with a few variations along the way). 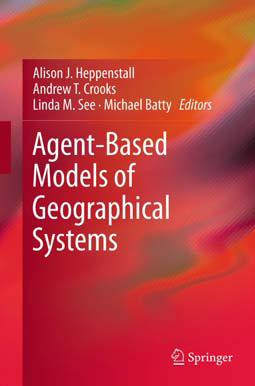 Many of my initial posts where focused on ways of utilizing agent-based models and integrating geographical information into such models. 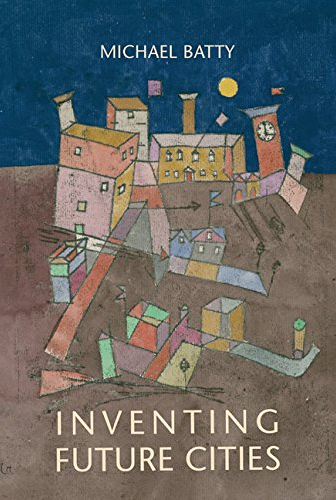 However, over time I have also branched out into writing about other areas such as the utility of volunteered geographical information and social media to monitor, analyze and model urban systems and how one can use such data to study the connections between people via social networks. 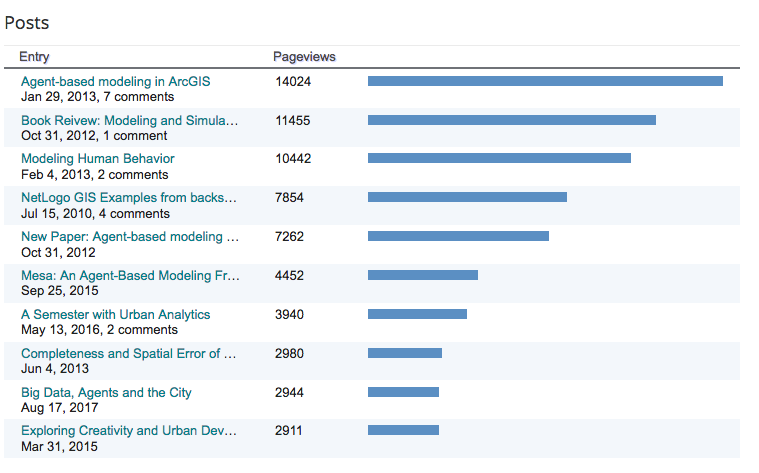 From looking at the statistics, since 2010 the most popular post (as you can see from the image below) is that of Agent-based modeling in ArcGIS (unfortunately this work is currently not being updated:( ) but it does show an interest in agent-based modeling in more of the mainstream GIS (or at least from some people). 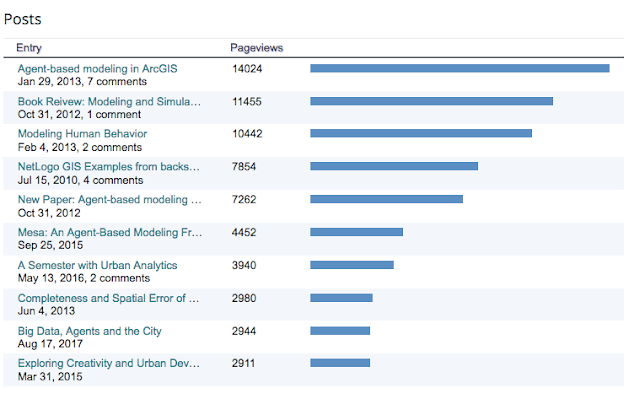 The other posts in the top 10 relate to modeling and analyzing urban systems and the people within them in some shape or form including a book book review I did for JASSS. Perhaps my favorite post in this top 10 is that of Modeling Human Behavior inspired by a book chapter written Bill Kennedy entitled 'Modelling Human Behavior in Agent-Based Models'. 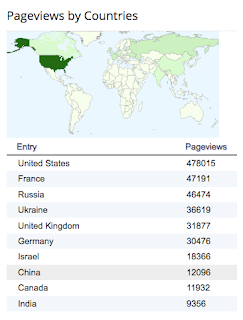 With respect to the audience of the blog, nearly 48% of page views come from the United States while the reminder come from all around the world (as you can see from from the figure to the left, including France, Russia and the Ukraine). The most popular search terms for people coming to the blog include "agent based modeling", "NetLogo GIS" "NetLogo Examples" along with terms such such as urban analytics and big data. Looking at what web browsers and which operating systems people are using to access the site (which takes me back to my Masters thesis when I was working on developing web-mapping features for the Gazetteer for Scotland), Chrome makes up 43% of all page views followed by Firefox (29%) and IE (16%). While for operating systems, 54% of visitors are using Windows, followed by Macintosh (27%) and Linux (8%). While I mentioned above my favorite post in the top 10, reflecting on which post I refer most people to, it has to be the one entitled Applications of Agent-based Models because it shows how agent-based models are being used in a variety of settings. Looking back on the evolution of GIS and agent-based modeling since I started blogging, its impressive to see how different toolkits have started to utilize GIS. For example my first post was a hack on how to integrate GIS into NetLogo, from backspaces.net. Since then NetLogo, MASON and other platforms such as GAMA have evolved to allow making it (relatively) easier for the integration and exploration of geographical information and agent-based models. 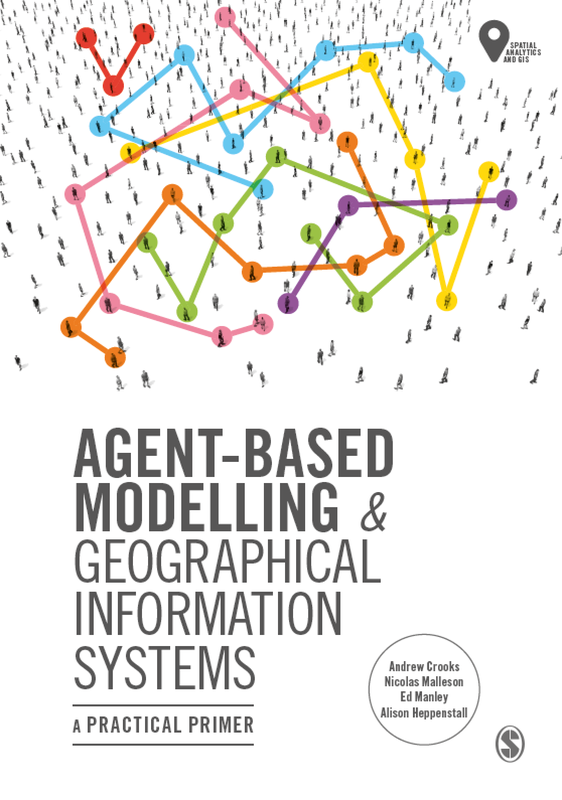 Moreover, when I started writing about this, there were very few example GIS and agent-based models (expect from Repast ones) or resources to get up and running with agent-based models but over time this has changed with more and more people sharing their models (thanks to things like GitHub (e.g. mason models, OpenABM)). There has also been a number of good text books written on GIS and ABM (and there is a great one coming soon from us) along with more blogs (e.g. Simulating Complexity) and courses being taught (e.g. Agent-Based Modeling Short Course at SESYNC). Lets hope this growth continues and thank you for reading and visiting this blog. If you would like to share your work on ABM and GIS please feel free to contact me or leave a comment a below.